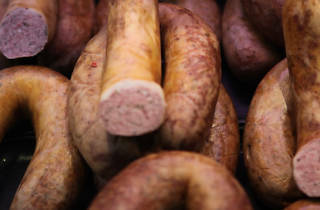 The döner kebab, the currywurst – invented by a Charlottenburg street vendor in 1949 – and the Berliner doughnut made famous by President Kennedy are all synonymous with the city, and can be bought from restaurants and street food vendors around town. 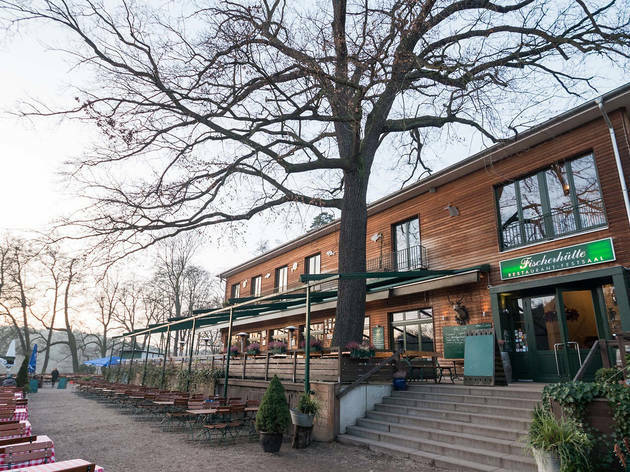 Here is our critics’ selection of where to find the finest specimens – as well as the best in traditional German dishes such as schnitzel and sauerkraut. 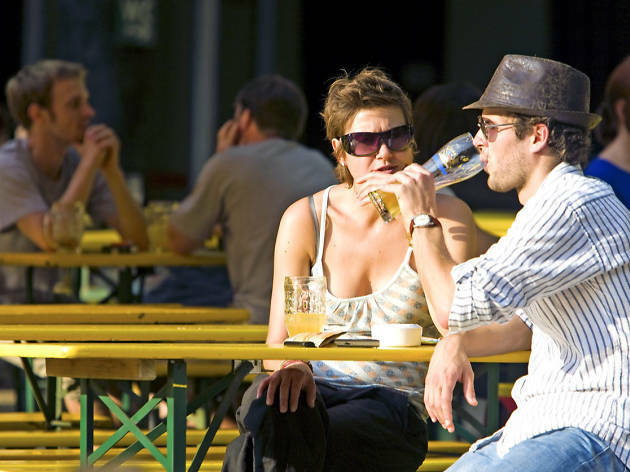 This rowdy beer garden has been doing Berliners a brisk service since 1852, and lies across the courtyard from an old ballroom of the same name, attracting a noisy crowd. 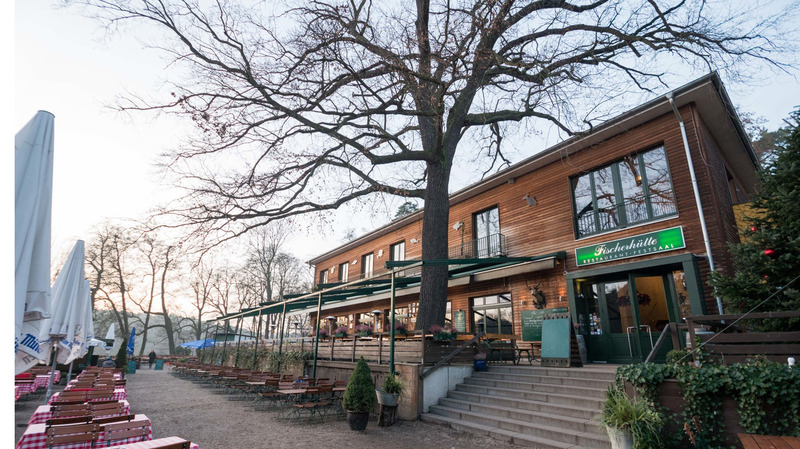 The enthusiastic beer-swilling, big wooden tables and platefuls of Bratwurst and Bretzeln (pretzels) can almost make you feel like you’ve been teleported down south to Munich. 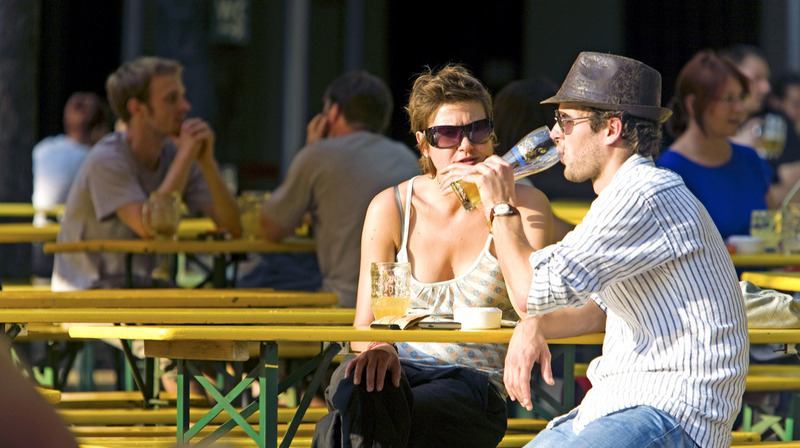 There’s an indoor bar with a traditional German restaurant but in summer you want to join the all-day buzz outdoors with a house-brewed Pils in the shade. Brunch is served from 10am-4pm on Saturdays and Sundays. 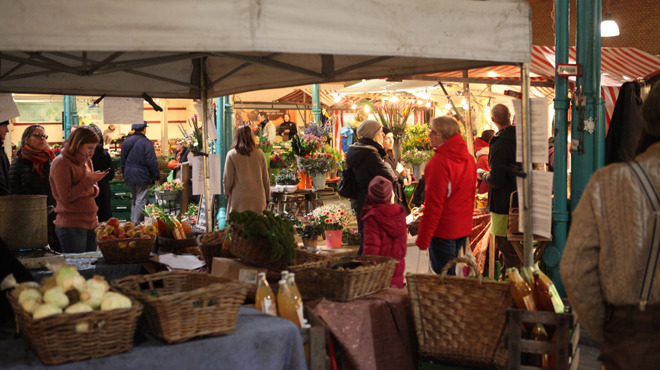 There were originally 14 covered municipal markets opened in the late 19th century to replace the traditional outdoor varieties and increase hygiene standards. Most disappeared and this listed building was going to be sold to developers in 2009 when a trio of local residents decided to launch a campaign to save it. 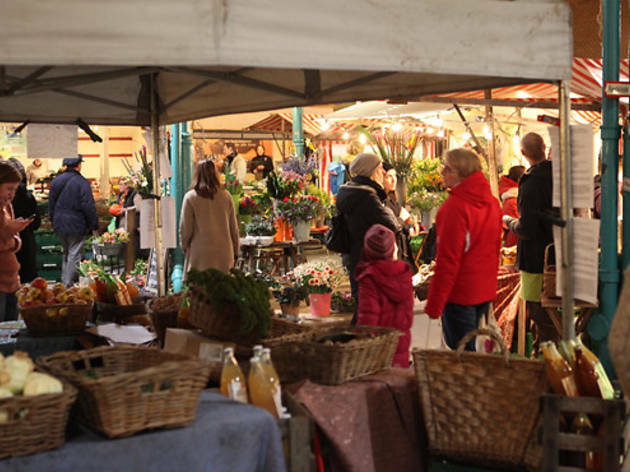 A few years later, the Markthalle reopened to much fanfare, with stalls serving up beautiful heritage vegetables and locally sourced meats. It’s also home to the excellent Heidenpeters microbrewery, with its changing selection of hoppy pale ales, and the traditional Sironi bakery from Milan. Closely aligned with the Slow Food movement, they host regular themed events like Cheese Berlin, which sells a multitude of artisan European cheeses, as well as the popular Street Food Thursday evenings (Thursdays 5pm-10pm). 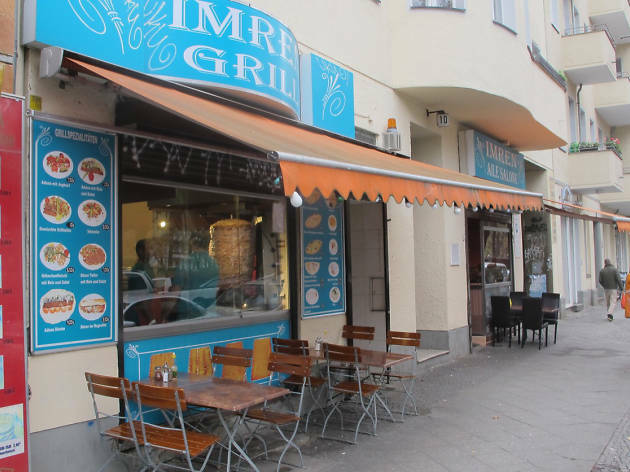 A trip to Berlin isn’t complete without sampling the city’s most popular fast food – the Döner kebab. As legend has it, in 1971 one Kadir Nurman decided to adapt the traditional Iskender-style kebab from north-western Turkey to more local tastes by putting it in a toasted flatbread with some fresh salad and sauce. Cheap, portable and filling, the Döner caught on massively and the industry is today worth some €2.5 billion a year. 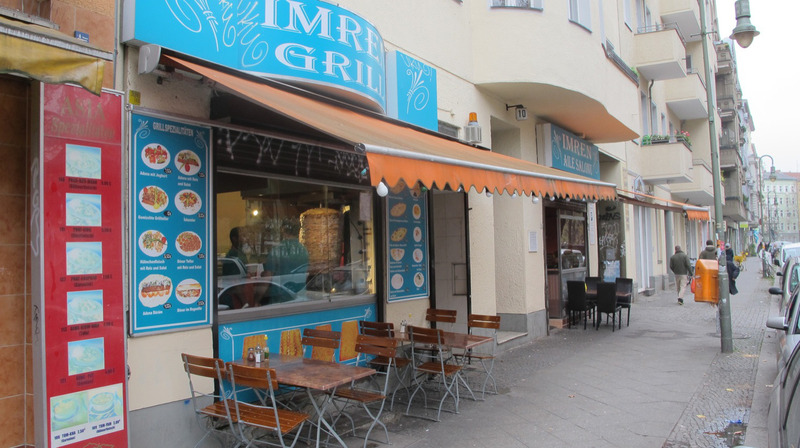 Naturally some of the best places can be found in the Turkish areas of Berlin, of which Imren Grill is in the lead. Their outlet on Boppstrasse, close to Kottbusser Damm has a big bare-bones dining room, popular with families; there are plenty of lunch specials including baked fish with stew and rice, but first thing’s first: order the classic dönerim brot (kebab in toasted bread), with its stuffing of lamb grilled in neck fat, fresh salad, sesame sauce and chilli flakes. Goods in hand, you might want to join the suited elderly gentlemen at the park in front, who congregate to put the world to rights over cups of sweet black tea. 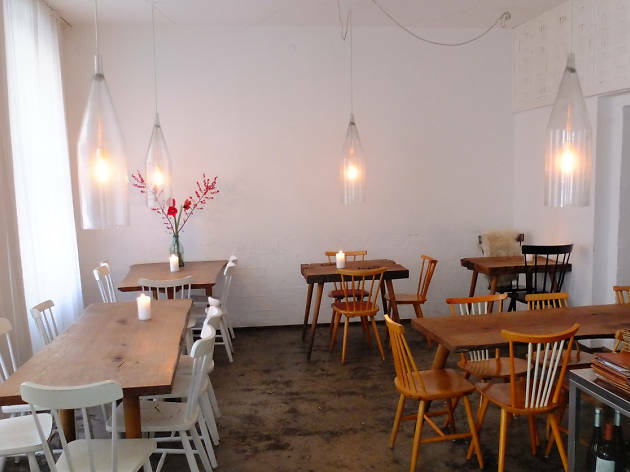 Das Lokal comes from fine heritage: formerly Kantine, a cult pop-up of sorts which had occupied a space earmarked for demolition in David Chipperfield’s architectural office. 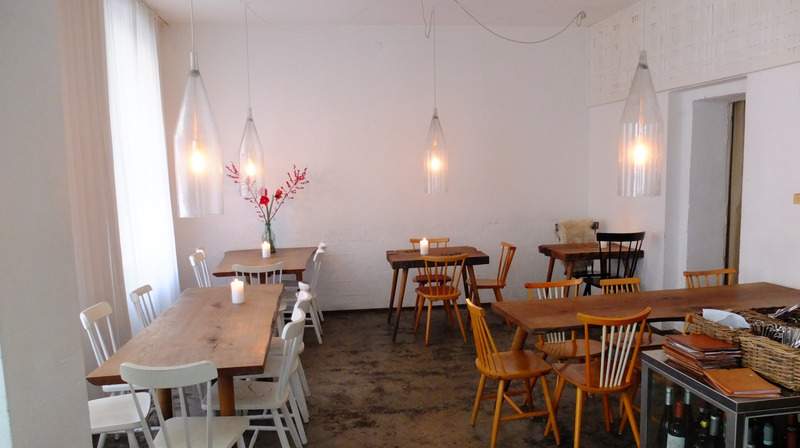 Their relocation to a permanent location on Linienstrasse sees the restaurant decorated with beautiful furniture, handmade from wood salvaged from the forests around Berlin. Das Lokal flies the flag for Portland-style locavore cuisine, using only the most sustainable of ingredients for its changing menu of German staples. The Mitte location makes it a popular lunch spot for local media types who come to talk shop over roast veg with salad or gulasch soup. The dinners are more elaborate affairs, starters of pigeon with chestnuts, mussels in broth or asparagus croquettes all designed to demonstrate the superior flavour of well-sourced produce. The kitchen is an oasis for offal dishes and game, with which Berlin’s surrounding forests abound – a welcome sight in today’s age of cheap industrial farming. Book ahead for dinner. 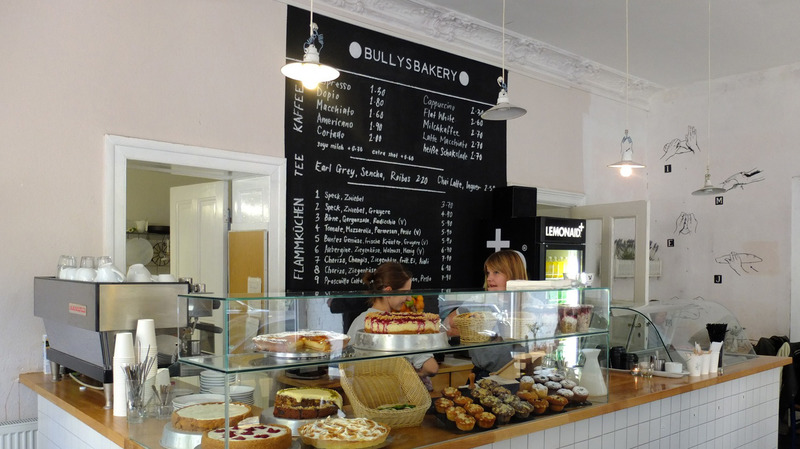 Countless column inches have been devoted to the city’s battle with accelerated gentrification and one place to witness it first-hand is over breakfast at Bullys Bakery in hipster mecca, Kreuzkölln. Hysterical news coverage aside, there’s no debating that Daniel, the half-Spanish, half-German owner, bakes the best croissants in town, oozing butter and with just the right amount of flake, perfectly paired with a bracing macchiato made from locally-roasted beans. After breakfast, there are various Flammkuchen – crisp pastries from Alsace topped with cheese and pear or ham – as well as fruity crumble cakes, tarts and a selection of muffins. 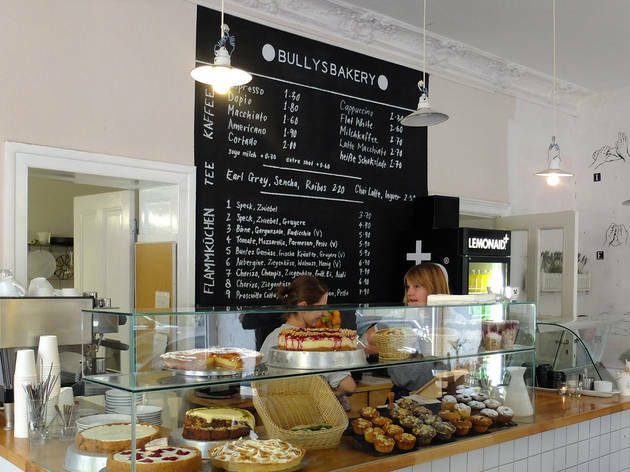 Watch out for Kurt, the café’s resident French bulldog who chucks his stocky little body around in the endless hunt for crumbs. Berlin can seem sprawling, with its large GDR housing estates and empty old factories, but it is easy to escape to its surrounding network of beautiful lakes, which have crystal-clear water running through them. Berliners love nothing more than the short trip to lakes like Müggelsee or further afield to Leipnitzsee, where they can swim, picnic and hike, often combining it with that very German enthusiasm for nudism. One of the most accessible by S-Bahn is Schlachtensee, to the west, which feeds into the much larger Wannsee. There’s a marked path around it as well as miles more through the nature reserve of the Grünewald forest. Overlooking the lake is the Fischerhütte, housing both a large outdoor beer garden and a more formal restaurant inside. It was originally built in the mid-18th-century as a rest house on the road between Berlin and Potsdam (the official residence of the Prussian kings). After a good stroll, nothing beats a hefty bratwurst and, depending on the season a fassbier (draught beer) or creamy hot chocolate. From the terrace you can watch the rowing boats slowly drifting around or, if it’s been below freezing for long enough in winter, the ice-skating. Inside, the modern brasserie features plenty of old photographs from its heyday in the 1920s when these lakes were Berlin’s answer to the French Riviera. The menu is suitably traditional, with mainstays like Schnitzel and Flammkuchen as well as seasonal specials like venison or white asparagus. 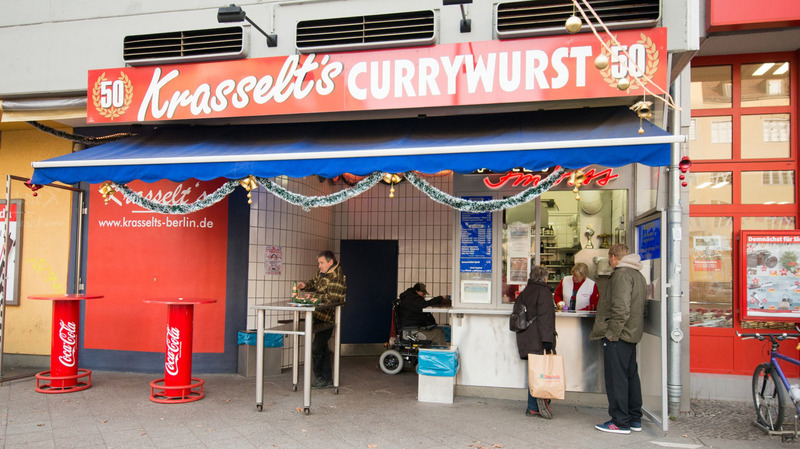 As with many trademark dishes around the world, various German cities claim to have invented the wildly popular Currywurst. Berliners know this is nonsense, and there’s a commemorative plaque on the corner of Kantstrasse and Kaiser-Friedrich-Strasse in Charlottenburg to prove it. On the afternoon of 4 September 1949, 36-year-old Herta Heuwer grew bored with waiting for customers at her humble sausage stand and began to experiment with spices and seasonings. Adding chilli powder to ketchup and some Worcestershire sauce for extra kick, she smothered a sliced bratwurst ohne darm (skinless) in the sauce then liberally sprinkled curry powder on top. 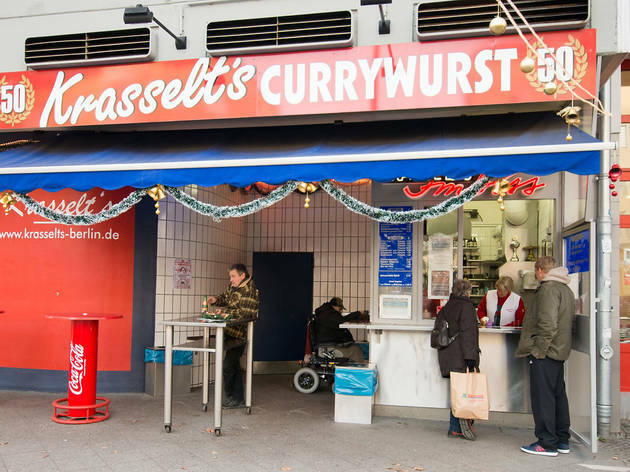 The story should also be taken with a liberal pinch of salt but to enjoy a real genuine Currywurst, avoid the long queues at tourist favourite Curry 36 and step out further afield to Krasselts, which has been knocking them out for over half a century. Still family-run, they guard their secret sauce recipe and grind and stuff all their own sausages. 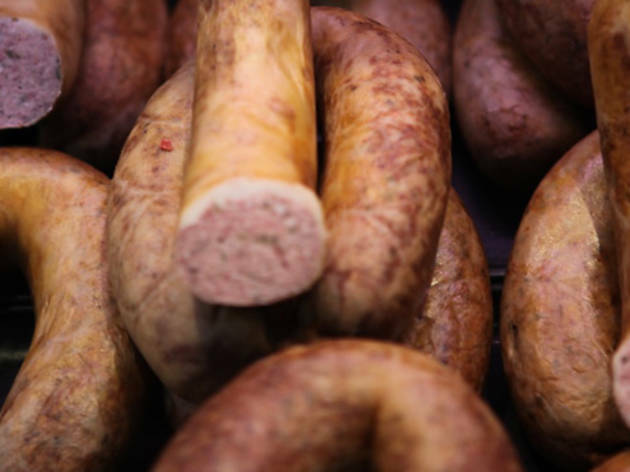 The East traditionally ate their sausage with skin (pig intestine), but these days the distinction has mostly disappeared. Enjoy at a standing table with a side of fries or a crusty white roll.